Heat oven to 350°F. In large bowl, stir cake mix, rainbow candy sprinkles, butter, milk and egg until soft batter forms. Scoop 20 tablespoonfuls of batter onto ungreased large cookie sheet. Bake 8 to 10 minutes or just until cookies are set. Remove from cookie sheet; cool completely. Spread frosting on bottom of 1 cookie; top with second cookie, bottom side down. Roll edges of frosting in confetti candy sprinkles. If desired, top each with a birthday candle. 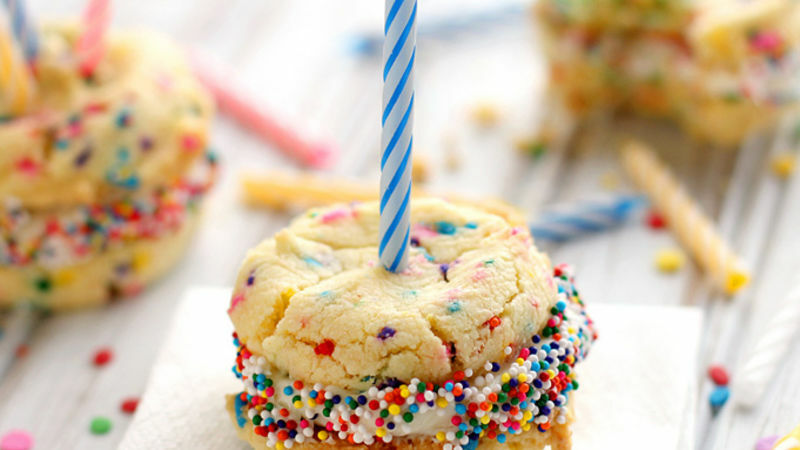 Rainbow candy sprinkles are added to the batter and offer a bright, party-like feel. If you don’t have rainbow sprinkles in your pantry, feel free to omit them. The cookies will still bake up perfectly and taste totally delicious. Mix it up! Try making this recipe with any of your favorite cake and frosting flavors!